I am not here to tell you about Narikala – you can find that information anywhere. I am here to tell you about the less-explored tourist places, places where I take my friends. Come along! Rent a car in Tbilisi and take the Dighomi road, the one that eventually leads to Mtskheta. Then turn right by the American Embassy, cross the bridge and turn left towards the Tbilisi Sea. There, on a lonely hill, a monument created by the sculptor, Tsereteli, casts its shadow upon the Gldani district. 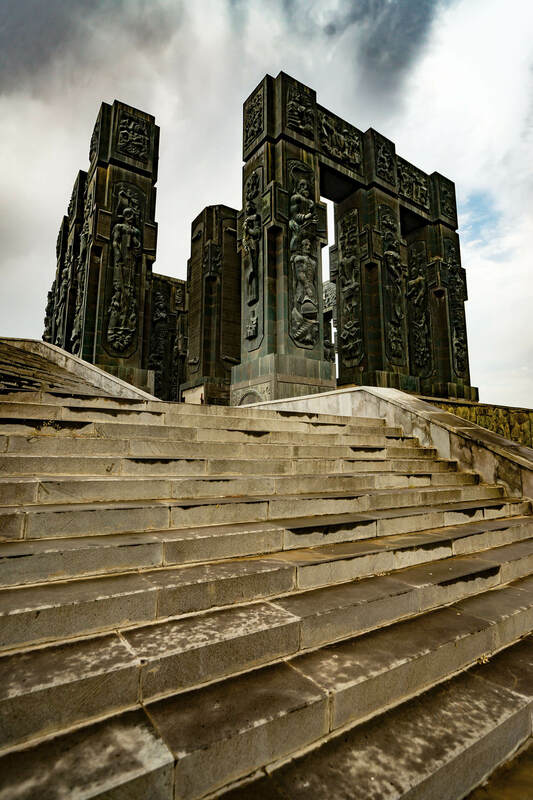 Every time I see this “Tbilisi Stonehenge,” I wish the Game of Thrones people could use it as a location. Picture Georgian kings trying to stab people with their swords, violently convulsing their torsos, unable to get down from the columns, and cursing the old gods as well as the new ones. What is this construction of pillars, kings, saints, writers and poets? Apparently, Tsereteli decided to depict major Georgian historical figures and he did it in his usual grand way. He started working on the monument in 1985 and has been adding pieces since then. The “Henge” is overlooking the Tbilisi Sea and gives a different vantage point for the city. 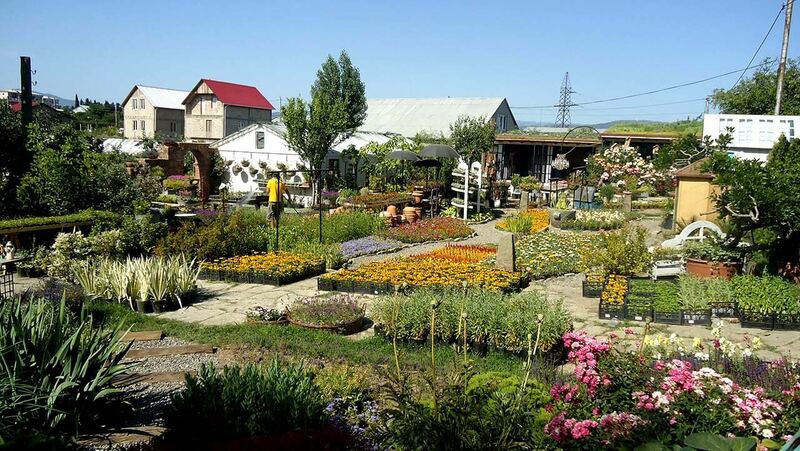 While you are in the Tbilisi Sea district, follow the road and visit Gardenia Shevardnadze, a plant nursery, where you could purchase a tree or two or just walk around the sweet-scented flowers growing in old boots, pots and pans, and whatnot. Gardenia has an outdoor as well as indoor café and serves teas, juices and cakes. It is a pretty green place also perfect for afternoon tea, darling. One of my favourite places in Tbilisi is Gudiashvili Square. It is located by Freedom Square, on the crossroads of several streets. Its location has not changed since the Middle Ages, although the buildings were destroyed during the constant wars. However, it still boasts the oldest building in Tbilisi, dating to the 19th century. City Hall decided to demolish them a while ago and this was followed by a series of protests called Save Gudiashvili. As a result, the buildings have been neither demolished nor renovated. Eleven buildings surround the square; they stand there as reminders of times past: the 19th century Russian Imperial administrative centre. Walk around and enjoy buildings still untouched by unskilled renovation (as is the case with many of Old Tbilisi’s buildings). On Gudiashvili Square, they are here as they were two centuries ago. Walk to the crossroads of Dadiani and Asatiani Streets to see the oldest wooden balcony in Tbilisi. P.S. Check out the Pur Pur bathroom. 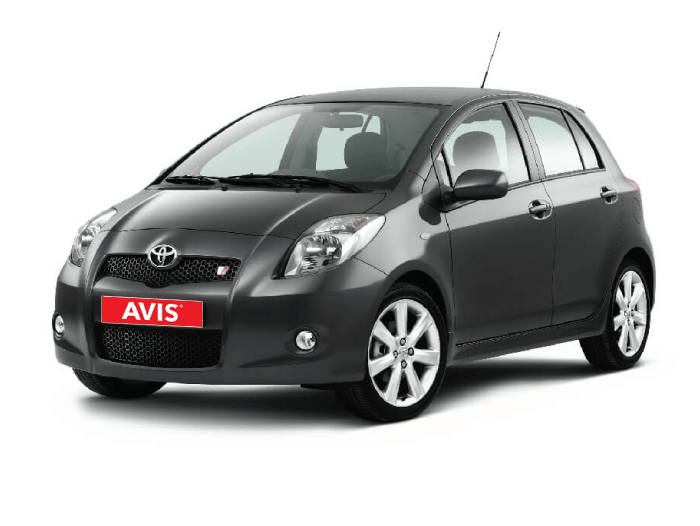 Rent compact car, like Toyota Yaris, to move around Tbilisi.